Biography of Late Gothic German Sculptor, Medieval Wood-Carver. works of German Gothic Art. from early 16th century Germany. 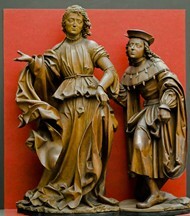 An important figure in German Gothic sculpture, the Swabian wood carver and sculptor, Veil Stoss is considered, along with Tilman Riemenschneider, to be one of the greatest experts of wood-carving during the Late Gothic period of medieval art in Germany, prior to the emergence (during the early/mid-16th century) of a genuine indigenous school of German Renaissance art. Also a talented engraver and painter, he endowed his characters with animated expressions and gestures, which when compounded with the life-like folds of their garments, gave his figures a dramatic appearance. Stoss' best known works of sculpture are: The High Altar of St Marys Church (1477-1484, Krakow) and Raphael and Tobias (1516, Germanisches Nationalmuseum Nuremberg). Born in Horb am Neckar, Swabia in 1447, Stoss trained in Nuremberg as an artist and married Barbara Hertz in 1473. Four years later, he moved with his expanding family to Krakow in Poland, where he would work on his first major masterpiece of Christian art - the majestic High Altar of St Mary's Church. Carved in limewood and painted, the 13 metres-high and 11 metres-wide work of altarpiece art remains the biggest gothic wood-carving in the world. It consists of 200 delicate limewood sculptures, painted in colour and gold foil. The central aspect depicts the life of the Virgin Mary and the saints, and above this is the Ascension of Our Lady and Lord, and finally on top is Madonnas Coronation by the Trinity. The wings (doors) of the sculpture are covered in colourful relief scenes from the life of the holy family. At the base of the altarpiece is a family tree of the Virgin Mary. Other parts of the altarpiece are made from oak and the background is constructed with larch wood. Other works he carried out at this time include a red sculpted marble sarcophagus of King Casimir IV (1492) in Wawel Cathedral (Krakow); a marble tomb of Archbishop Zbigniew Olesnicki in Gniezno Cathedral (1492); and the altar of Saint Stainslaus. For developments south of the Alps, during this time, please see: Italian Renaissance sculpture. In 1496 Stoss returned to Nuremberg with his wife and eight children. 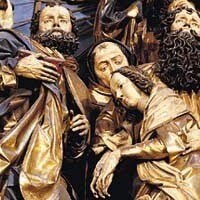 Between 1500 and 1503 he worked on small commissions, group and single wood and stone sculptures, as well as an altar piece 'Assumption of Mary' for the local church in Schwaz. Around this time, the Stoss family received some bad news. It transpired that their life savings had been defrauded, and they were left virtually penniless. Attempting to regain his money by copying the seal and signature of a fraudulent contractor, Stoss was caught, and branded on both cheeks. He was not allowed to leave the city of Nuremberg without permission. The shame and bitterness would remain with him for the rest of his life (although the Emperor eventually pardoned him). In 1504, in spite of the restriction on his movements, Stoss travelled to Munnerstadt and painted the altar of Tilman Riemenschneider. In 1506 he was arrested again for a brief period. Nevertheless, his artistic ability was highly respected and the commissions continued to arrive. In 1512, the Emperor requested his input for the planning of the Imperial tomb in the Hofkirche, Innsbruck. Between 1515-20, he worked for a rich merchant called Florentine Raphael Torrigiani, who paid for several church sculptures in an attempt to guarantee his place in heaven. One such item of sculpture, very famous now, is Tobias and the Angel (1516), now in the Germanisches Nationalmuseum, Nuremberg. In 1523 Stoss began work on another important work of Biblical art, namely, The Virgin Altarpiece of Bamberg Cathedral. Originally made for a Carmelite convent in Nuremberg, it was subsequently transferred to Bamberg by Stoss' son during the reformation. To learn how to judge artists like the Late Gothic religious wood-carver Veit Stoss, see: How to Appreciate Sculpture. For later works, please see: How to Appreciate Modern Sculpture. Stoss created wood carvings that were angular, nervous and realistic looking. He synthesized the sculptural styles of Flemish and Danubian art, which along with the realistic sculptural art of his contemporary Nicolaus Gerhaert von Leyden, would go on to influence the development of late Gothic art in Germany. His later works show some restraint and careful study, which may have been a result of studying the works of the painter Albrecht Durer. According to the Catholic Encyclopedia, Stoss was one of the first Northern European artists that could favourably be compared with Italian Renaissance artists. His influence over later German Baroque sculptors, like the German master carver Jorg Zurn (1583-1638) - famous for the extraordinary High Altar of the Virgin Mary (1613-16), in the Church of Saint Nicholas at Uberlingen - should not be underestimated. He died in 1533 and was buried at St. Johannis cemetery in Nuremberg.  For the history and types of wood carving, see: Homepage.